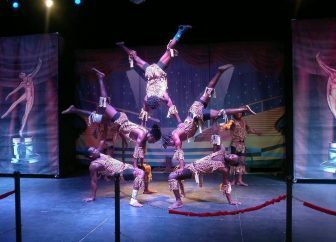 Zuzu African Acrobats are a high energy acrobatic group from Mombasa Kenya and known for high energy pyramid building, chair balancing, hat juggling, comedy, super-fast skip rope, and hoop diving. The group was a semi-finalist on America’s Got Talent, has appeared on The Late Show with David Letterman, and will be performing at Super Bowl LIII in Atlanta. There will be a dinner in the Great Hall, New Main, preceding the performance. The event is free and open to the public. No RSVP or registration necessary. Auditorium seating is first-come, first served. The event is co-sponsored by Multicultural Affairs, Student Success, Dean of Students, Equal Employment and Diversity, Marketing and Communication, the Institute for Community Engagement and Scholarship, Public Safety/Security, Student Life, and Leadership Development and TRIO.